Diamond rings were most commonly associated with women but today there are many takers for such rings with men also. The modern man often chooses to defy all conventions and go for style that is often considered unconventional. 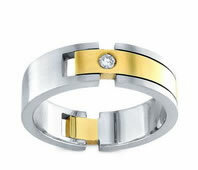 Keeping in line with this the men’s diamond rings are fast becoming a fashion statement today. There are more and more men who are going for such accessories. Men wearing wedding rings can be considered recent in the historical times. It can be said that only after the Second World War men started wearing wedding rings. This style got popularized and also dwindled for a period of time however now this style has taken off again and it has become one of the hottest trends in the season. However, when it comes to jewelry for men, there are different considerations that are to be kept in mind when looking out for jewelry for men. For one thing women will not care too much about the wedding ring. However, an engagement ring is what is special for a woman. The engagement ring will form the feature on her finger. This is what will be admired. Therefore such a ring for women has to be a diamond solitaire that would make sure that the ring is admirable. There should be more effort put towards the purchase of an engagement ring for women than a wedding ring. A wedding ring for women should not overpower her engagement ring. There are some brilliant stones that you can choose to form the wedding ring for a woman; it should never overshadow the diamond ring. For men this is completely different. There is no engagement ring for the man. Hence the diamond wedding ring will be the only feature that will be seen on the hand of the man. Hence it is essential that the diamond rings for men are big. Big would mean the rings would be more prominent and showy. Men are not mostly fond of jewelry. Therefore this piece of jewelry is the probably the only piece he is going to wear for the rest of his life. This piece has to tell the world who he exactly is and this can be done through careful selection and choosing of the diamonds and the seating of the diamond. Men commonly choose rings that have many small pieces of diamonds set into the ring which forms the seat for the diamonds. Although it is not uncommon to find a man wearing a ring with a solitaire diamond, these are more common with women. Men look to have a square shaped seating with diamonds on it. There can be different materials selected for the seating. These include silver, platinum, titanium and also carbon fiber. The diamond rings for men is about the diamond and the ring together which is unlike the women whose most important criteria would be the diamond. Also the men diamond rings are most commonly wider. They can be found at a diamond store in the separate section for men’s jewelry.